DAVID LE. Gloucester Times. Manchester-Essex catcher Alex Ray (15) left, congratulates pitcher Adrian Frattini (11) after he hit a 2-run home run in their game against Mystic Valley on Friday morning. 4/22/11. , DAVID LE. Gloucester Times. 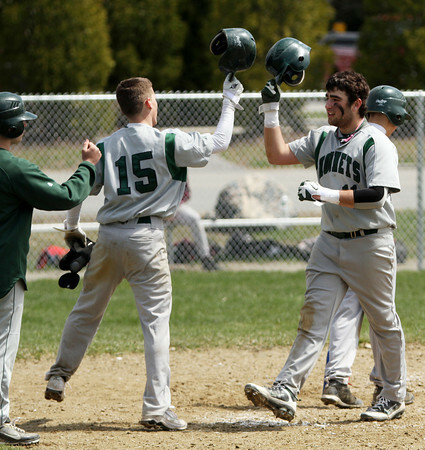 Manchester-Essex catcher Alex Ray (15) left, congratulates pitcher Adrian Frattini (11) after he hit a 2-run home run in their game against Mystic Valley on Friday morning. 4/22/11.